Using glaze can add a dimension of rich color to a painting like nothing else. This particular technique takes a bit of time, as the painter must wait for each layer of glaze to dry before applying a new one, but is well worth it. 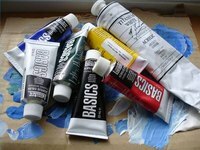 Making acrylic paint glaze is easier than one might think and any color glaze may be made. Prepare a clean dry mixing dish and pour into it about a quarter cup of the acrylic gloss medium. This can be bought at any art supply store. Add the acrylic additive also called a retarder. Just shy of a tablespoon will do. Mix it in smoothly with a Popsicle stick or brush. Add the acrylic color of your choice. Start by mixing in a small pea sized amount. If you wish it to be darker add as you wish. Multiply the recipe as necessary depending on how much glaze is needed. You may want to mix just a small amount at a time however if you will be working on your painting for short periods of time. Mix colors individually in a new clean dish with a clean brush. This way you may make several glaze colors while keeping them pure. Use a different (softer) brush to apply to the painting. Add a few drops of water to the glaze to make it even thinner and smoother to apply.